Day two of the Lotus Yoga Off The Mat challenge is yoga and family – how does yoga impact your family (pets included!)? Do you do yoga together? Do you apply a particular yogic idea or behavior or practice into your family life? Maybe yoga is an escape from family drama, or a retreat that prepares you for your many roles at home. We do what we do because we believe in it. If you are doing something because you are seeking / expecting a specific response or reward, you will be disappointed. As a teacher, I know that I may never know how, or even if, I’ve impacted the lives of my students. The effects are not immediately visible. But every now and then, I hear from a student who shares how their time with me impacted them and the impact that had on their career choices and development. It’s the same with parenting. When my daughter was small, I took her with me to yoga classes (that was before ‘yoga for kids’ became a thing). She sat quietly in the back with a book or a coloring project. She never said much about it, other than she couldn’t understand why we always took a nap at the end of our class. She never showed any interest in participating. When she went away to college, however, she took a yoga class and loved it. 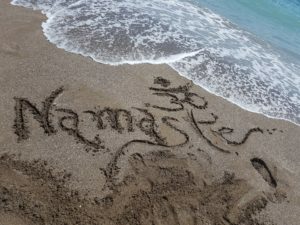 That began her personal journey with yoga and now, it is a lifestyle so imbedded that I am sure she is a lifelong yogi. And one year ago, she completed her 200 YTT course! She also has an adorable dog, Beau, that she loves more than I ever thought possible (she never showed any interest in pets when she was younger) and sweet little Beau is by her side all the time, every yoga practice included! 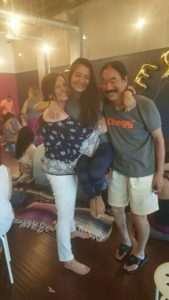 I believe that she was influenced not only by watching me do yoga in class, even if her observations were disinterested and unengaged, but also by the yogic philosophies I carried off the mat and into our lives. 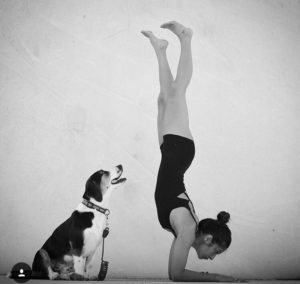 How do you think your yoga practice influences your family (pets included!)? Leave a comment below and share your experiences with yoga and energy.